Pint-sized and Simple: Purina® Beyond All Natural Dog Food: Four Paws Up! 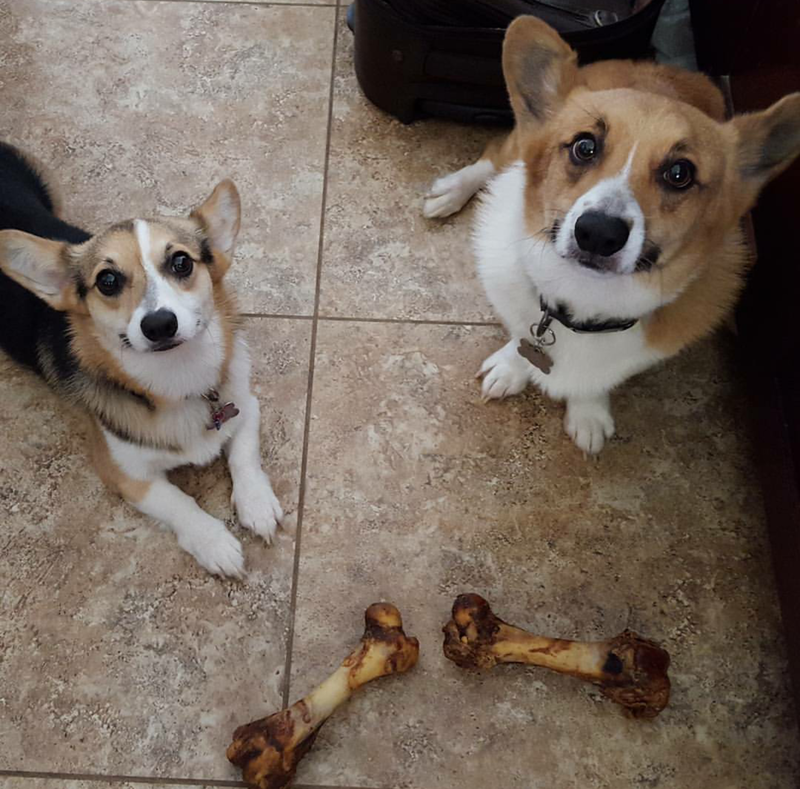 Purina® Beyond All Natural Dog Food: Four Paws Up! We all have that one friend who loooves to post pictures of her children on social media, and after a while all those pictures start looking the same. Well guess what? I'm that person, but with dogs. This is him shaking hands with his left paw...And omg this one's with his right! I'm pretty sure my friends don't ever want to see another corgi again. But when you love someone or something that much, who cares what others think, amirite?? Since I don't have my own tiny humans yet, the furries are my children. I mean, they're kind of like kids. They don't like baths. They got the sibling rivalry thing down. And of course, they need to be fed. When it comes to food, I think I'm more careful about what goes into my dogs' bodies than my own. When Macho was a puppy his favorite treat was made in China and I didn't think much of it until the FDA announced that it contained a toxin that was suspected of causing disease in hundreds of dogs. 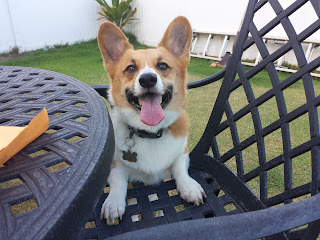 At that time we were planning on getting him neutered, but when he went in for his pre-op exam they told us his liver enzymes were elevated so they couldn't do the procedure. Suspecting it was because of the treat, we stopped giving it to him and a couple of weeks later when he got re-tested, everything was a-ok. Since then I've stayed away from treats made in China and eventually that led to making sure he gets quality dog food as well. So what do I consider to be "good quality" when it comes to dry dog food? Unless your dog has specific diet restrictions, you'll probably want to put him on a protein-rich diet. First of all, I make sure my dogs' food has meat in it. In that regard, I avoid anything with grains as the first ingredient. Then I look at the meat-to-grains ratio to make sure the meat outweighs the grains. That means even if the first ingredient is chicken, if it's followed by five different grains before the next meat product, I probably won't buy it because the grains likely outweigh the meat. I should also mention that I'm not too picky when it comes to real meat vs meat meal. Meat meal gets a bad rap because it's not pure meat (there's skin and bone in there as well), but it's helpful to keep in mind that pure meat is mostly water which evaporates during the dehydration process, so in reality the meat that you saw at the top of the ingredients list (which uses pre-dehydration weights) should really be several spots lower. On the other hand, meat meals are powders to begin with so they're not affected by dehydration as much. That being said, it's nice to see real meat as a first ingredient, but it should directly be followed by a chicken/salmon/duck/specific-animal meal -- plain ol' "meat meal" on the bag doesn't cut it; I like to know what protein source it's coming from. Finally, one thing I try to avoid is meat byproduct meal. This is almost like a meat meal but with heads, feet, and guts thrown in the mix. That's probably where most of the nastiness associated with meat meals come from so I try to avoid it altogether. 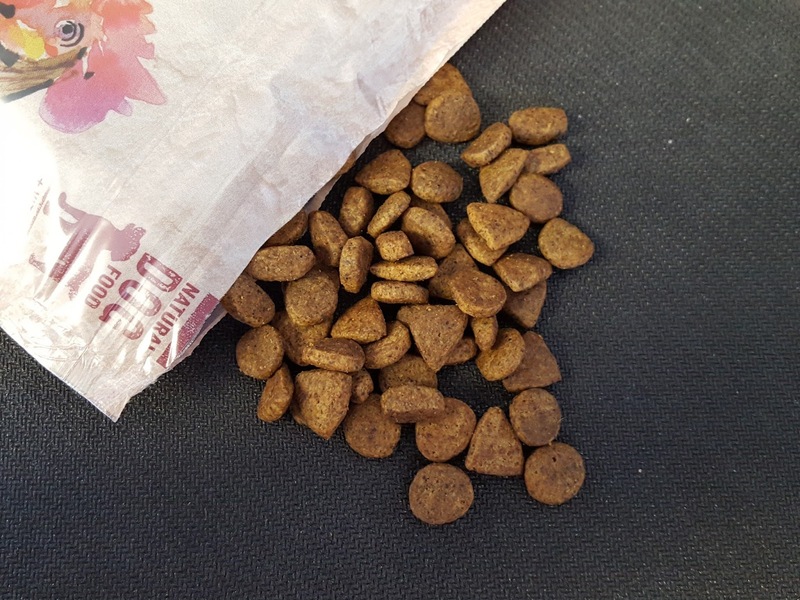 What About This Dog Food? Purina markets several brands of dog food, a few which my dogs have tried before, and yet somehow I never knew Purina Beyond existed. It's probably because no store in my area carries it except for Target, and I'd never thought of looking for dog food at Target before. 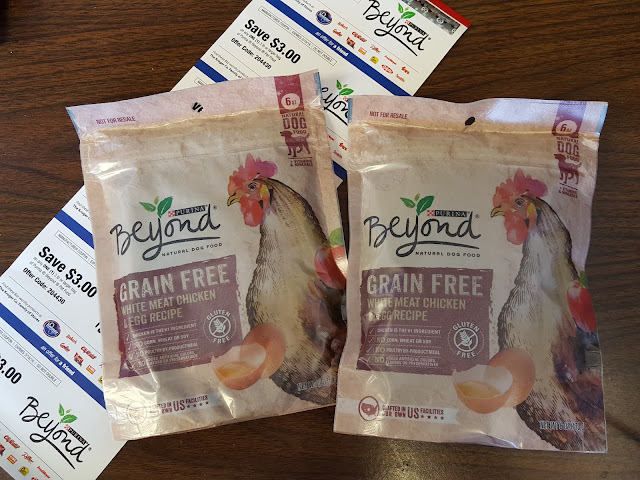 Armed with my basic knowledge of how to pick out dog food, I immediately jumped to the ingredients list when I got my hands on a bag of Beyond. 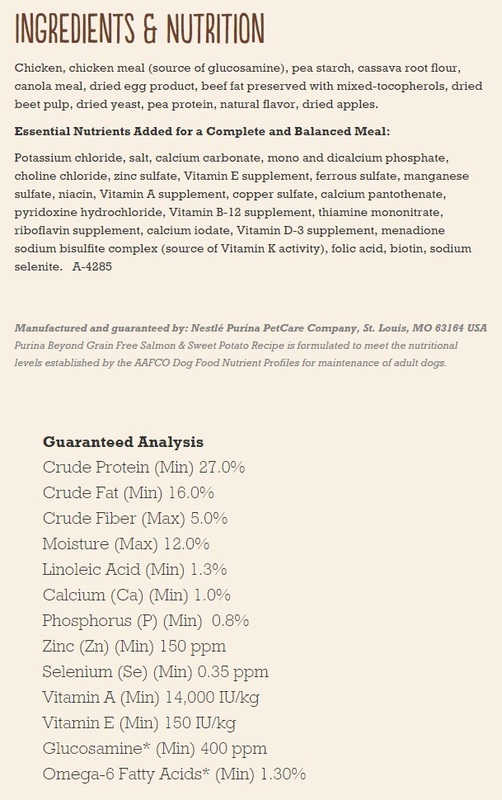 Purina Beyond White Meat Chicken & Egg ingredients. Meat as the top ingredient? Check. Followed by a specific-meat meal? Check. High meat:grain ratio? Check. Any mystery meats or byproducts? Nope. So far this looks promising, but the real test is whether the dogs will approve. Macho used to be weird with food; he'd get bored of a food brand after a week, especially if the kibbles were uniform as in the case of Beyond. When he'd get bored of a dog food, he would eat a few kibbles then walk away. Taking his bowl away after 10 minutes regardless how much kibble was left helped some, but what REALLY helped was getting another dog who was willing to eat his food for him (thanks, Pebbles). Now Macho loves his food no matter what it looks like. That's why I wasn't too worried about whether they'd like this one. I KNEW they would. Macho eats everything so that Pebbles can't get to it, and Pebbles just eats everything. Period. 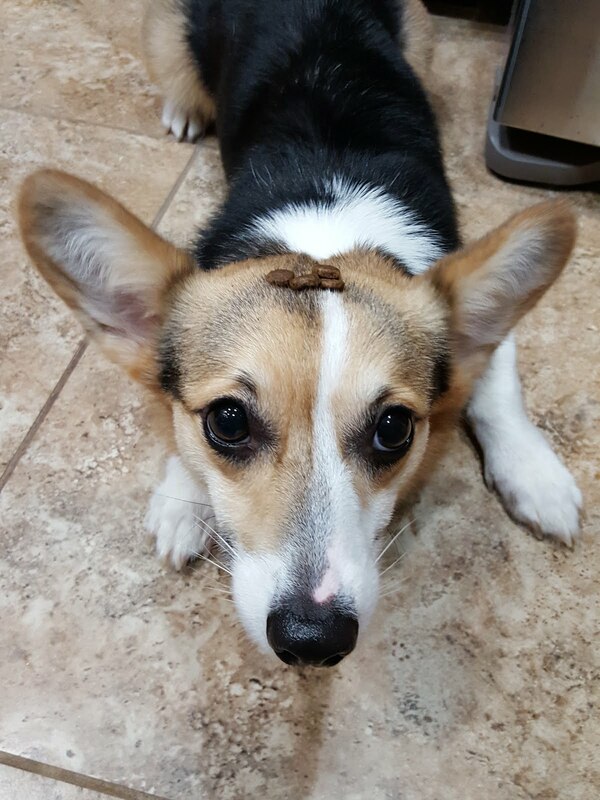 Silly dog. But back to the dog food. 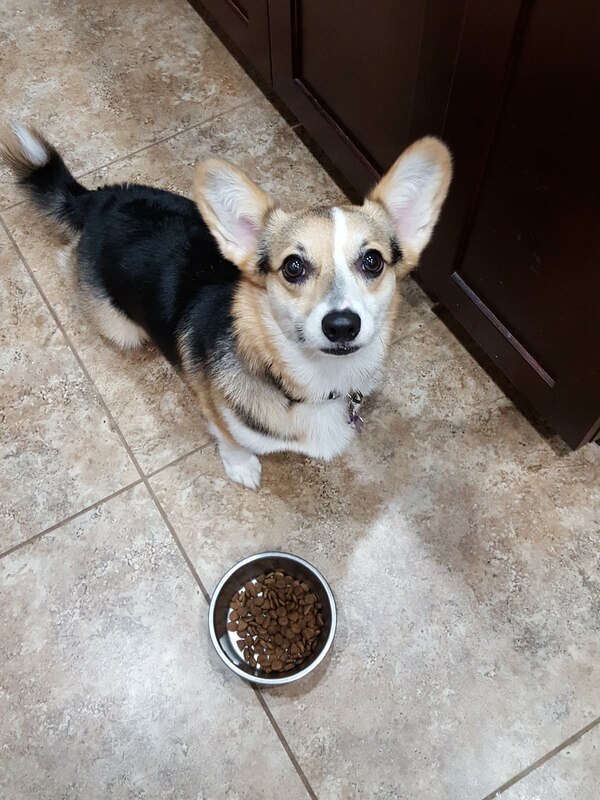 Unfortunately, poor Pebbles didn't get rewarded with that bowl of dog food as soon as she finished modeling for me. I'm sure she was mad a me for a while, but she has a bad habit of eating way too fast so I usually put her food in a Kong wobbler. But when she finally got that wobbler she was in heaven. Macho was no different. 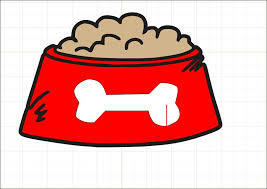 He continued licking his bowl long after it was empty hoping something would reappear. I think Purina Beyond dry dog food won a big fat seal of approval from us. I'm satisfied that the fluffies are getting nutritious, high-protein food. As far as the dogs are concerned, well, it's food. They're happy. However, like many better quality dog foods, Beyond is on the pricey side. My local Target only sells the 3-pound bag and it's about $10. My pups will go through that in about a week. I'd hate to see how quickly a large dog would finish it. I think I want to get the Tuna & Egg recipe next. I like to change up the variety every so often and I don't remember ever giving them kibble with tuna in it. I'm sure the dogs would appreciate the change, too. Note: I received Purina Beyond dry dog food complimentary from BzzAgent for testing purposes. All opinions expressed in this post are my own mostly my dogs'.